The largest museum of its kind in the world! 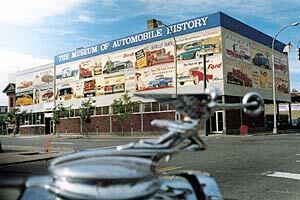 People of all ages are being captivated by the new Museum of Automobile History in downtown Syracuse, New York. Here everyone will see the amazing world that the automobile has left in its wake over the past 200 years. 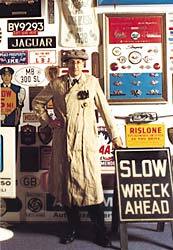 Over 10,000 objects show the car just exactly as people have seen it, loved it, and laughed at it, all through the years. 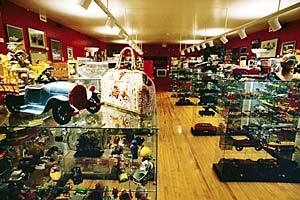 You will find a bit of your own history, too, because the museum encompasses information on motorcycles, trucks, and at least a thousand different makes of cars. Take a walk through the Age of the Automobile, starting with an account of one of the first attempts at automaking in the1770's, and on through to the cars of the 1990's. The entire family will enjoy this unique new musuem! 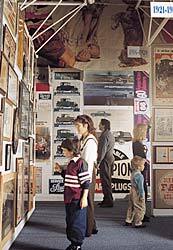 Cars are even in the air, visitors touring the galleries hear original radio advertisements and musical jingles for great cars. The museum is also on the move with video. Race footage, vintage television ads and historical documentaries run on a large screen, set on the back of a miniature truck. The collection is displayed in a sleek new setting, measuring 12,000 square feet. Each of the two main galleries are filled right up to their 25-foot ceilings. 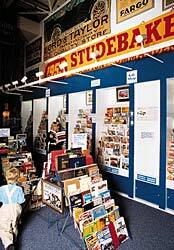 So many of its displays are one-of-a-kind that any listing of the contents is a partial one, but you'll see fine art oil paintings, and drawings by American and European artists, folk-art models, rare advertising (including a set of legendary Burma-Shave roadside rhyming signs), original photographs, Detroit styling models, autographs and letters, racing memorabilia, dealership and roadside signs, humorous prints, toys galore, Hollywood movie posters, unusual auto accessories and gadgets, colorful pedal cars, showroom posters, and even several presidential-car license plates. Outside, the museum literally stops traffic! The exterior is lined with an eye-popping set of 20 original full-color billboards (each one measuring 20 feet by 10 feet), long-lost ads for some of the greatest cars of the 1940's and 1950's. You won't see anything like them anywhere else. Automobiles themselves don't mirror the people who used them as vividly as the items left behind by those people. The Museum of Automobile History reflects the monumental influence of the car, as well as an unbridled enthusiasm for the automobile. 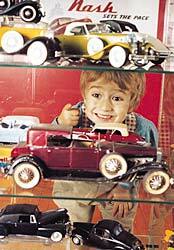 It is a memorable automobile trip and a dazzling display of the world on wheels, for everyone of all ages.